Got a problem? Need some help? Just standing there shaking your head? Don’t know what to do? You’re not alone. Send us a link to photos of your design quandary and let the Desire to Inspire design crew help you …. that’s you lot… the readers…. get to it! You are coming up with some stellar ideas each week so it’s time to do it all over again. Besides I have some rest to get back to. Can’t disappoint Doctor Gorgeous! This week’s problem comes from Nat who went through the heart breaking flooding earlier this year in my part of the world. I think we can come up with some better ideas than just Ikea shelving… just remember cheap and fabulous! After emailing Nat about what else was going in the room this is what she replied. See what Nat has to work with after the jump as well as the shots from the flood and its filthy, smelly aftermath. Oh Nat what a mess! Time to get to it team. Just remember very limited budget but miles of style. Easy right? I am really sorry for the trouble you were in earlier this year and everything that it took to get your family back on track. It is, however, good to see that you are past it, building things up again and being creative about it. I absolutely love the idea of a a built in lounging area but think that a desk and shelving solution may work well too. You could probably select a nice board from your local lumber yard, have it cut to size and have installed with brackets for next to no cost. Underneath you can put a smaller storage unit (Ikea has small metal shelving units like the Helmer) . Above the desk you can build shelves so that in length they follow the slant of the ceiling. To offset the straight lines of the shelves and desk, I would find an antique chair with curvy lines and if needed have it reupholstered. For the storage space beside it, I would find old shutters (I would go for a weathered look), and install them to close the space up. Whichever route you choose to take, I am sure that the result will be spectacular and we will all be looking forward to seeing it on Desire to Inspire. I'd love to see the back wall of the larger nook painted a different color to bring in some brightness, and some ambient lighting to highlight the shape. A reading nook would be pretty sweet. The smaller nook: how about an enormous drawer? Could be on rails or casters. The front panel smooth and flush with the wall and painted the wall color so that it sort of disappears. Simple, low profile, modern drawer pull. With a fitted drawer you can utilize all of that deep space for storage. I hope you post "after" pics! 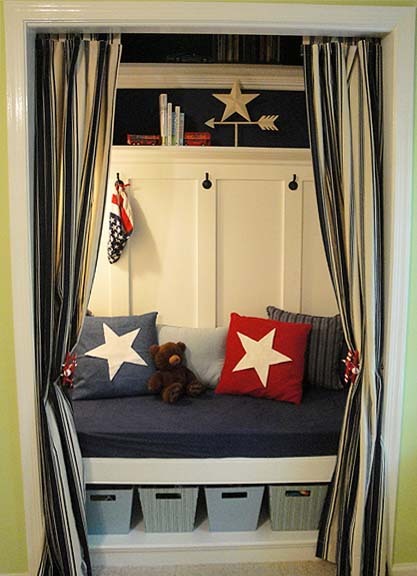 I'd put a mini day-bed sort of seating space in the larger nook, and would suggest wheeled storage bins – the kind that's like a filing cabinet – to keep things handy in the shorter space. That way to can get more storage with it being so deep – put things you use less often into bigger bins in the back, and more frequently used items in tall carts towards the front, and a door to hide it from sight. That way, when you need something you can just wheel it into the room. Here are some examples of what I mean – you might even be able to build your own wheeled furniture, too.. The examples taken from Wal*Mart, I only looked at items that were less than $100 (American). Yes, lots of pictures… I think rather visually, so pictures help me describe what I mean. I wish you luck, and hope that we will get to see how things turn out! I have two suggestions for your nook. First: if you don't have a office at your home, you can place a wood table there, with a nice with a touch of vintage chair. Put a nice lamp and some books to decorate. Second: Build a seating area, with comfy pillows, and light drapery. For both options, you can also build a shelving, with different levels. But don't use all the width, or it's going to be too deep. Put some accessories to decorate, and use a wallpaper on the nook walls. You said that your kids hang out them, so you need a lot of seating area… You can definitely use your couches, but not all together. I think you should do two seating areas. For the first one, use your big purple/gray couch on the wall that has the window next to the square nook. Place a coffee table in front of it, and two one-seat chairs (without armrest) opposite to the couch. For the second seating area, use the two armchairs that you already have (to connect both areas) and place your grandma's table between them (place them "looking" to your sliding doors). Put your sideboard next to the chairs, on the same wall as the couch, and a square, comfy ottoman in front of the armchairs. You can place your tv in the wall opposite to the couch, and for your square nook, you can build about three shelves on trails, so you can access everything. You may play with the angle of the armchairs so it can fit better on your room. Hope you like our ideas, keep us posted, and good luck! oh no, the flood was a real disaster, im glad to know that Desire to Inspire has Design Crew now! Are you looking at elevating the floors? what if the flood will happen again? I am sure you will be able to find a solution! Is this consultation free? Anyhow, I am excited to see the renovation results=) Goodluck! Hi, to hear all you bad news. I love these project that challenge you. Here's what I would do. For the bottom right side, get two door fronts. The first one, you install to cover the very precious hiding space for bins of "out of season clothes" or what have you. The second door front,you install above it, directly on the wall. It's a pretend door. It will make the entire wall look like a built-in. The large space is crying out to be a computer station with a worktop, sockets and a light. Or even a sewing workspace. I can't believe you didn't put sockets in there – high up if flooding is a problem. What you can do with the crazy square opening next to it I don't know. Build a wine rack in it or make it into a dog's nest. You could just put a door on the smaller opening and use it as storage. You know what would be super cool!? Although, it doesn't really look big enough (I'm just hoping because I love, love, love that trundle bed!). A cheap and easy solution would be to use that space for your ugliest and least used stuff, like camping equipment, and place a mid-level BILLY bookshelf from Ikea in front of it. I would go with a low height so that the window is minimally blocked. If you wanted to be able to get at the stuff more readily you could quite easily put the bookshelf on casters so you can roll it out of the way. Even cheaper: hang a pretty scarf or other piece of fabric from the inside to hide the storage. As for the larger space, it depends on how you're going to lay out the furniture around it. I hate looking at big, ugly TVs so if yours fits and you can arrange the couch and chairs to face it I would put in a shelf, like Jelana describes and stick your TV out of the way in there. Add two shelves and you've got room for your DVD player, etc. On the floor under the lowest shelf get two or three baskets to keep remotes, movies, video games and so on. I also like the suggestion of putting a desk in there. You don't have to search for a table that fits just right, just make a single shelf and add a cool chair. A wicker chair would be particularly cozy. Alternatively you could put in one of my latest obsessions, a little bar cart with pretty bottles of liquor, wine and sparkling water laid out. Although, perhaps not the best idea if your teenagers are going to be spending a lot of time in there, haha!! Best of luck. PLEASE send the after pics! Hi, sorry to hear about the effect of the flooding on your home…. I love the flooring as well as the smokers table you already have… I agree with what some others have pointed out that the larger one would be a lovely cozy/reading nook. You could put storage underneath the seating, I would make it open like a chest, so you would actually lift the seat if you need to access any stuff. If you decide to go with shelving, I would make sure to get them fitted exactly into the space and put lighting underneath each shelf (you can fit the wiring behind the skirting – if you're putting skirting that is)…. Cabinets at the bottom would be very handy for the stuff you don't want to keep on display. I don't know what ages your children are but since you mentioned toy boxes, I think that the smaller and deeper square shaped nook would be a great toy/hideout for kids. I know that my 3-year old would just love it.